A Southern Grace: "I would drape myself in velvet if it were socially acceptable." *My Seinfeld reference doesn't come out of nowhere. Bear with me. Confession: I don't see Valentine's Day as a holiday, but rather as an excuse to unashamedly wear pastel pink and consume copious goodies. In trying to decide what to bake for our monthly office potluck (a newly-instituted occasion), I considered lots of things and finally narrowed it down to red velvet cheesecake and red velvet cupcakes. The easier of the two won out (plus, the thought of pale pink cream cheese frosting excited me greatly), but I do see a red velvet cheesecake in my future. I opted to use less than an entire bottle of food coloring, so the cupcakes turned out more pinkish-brown than red. Never fear--the frosting was lovely and effectively covered and masked the less-than-stellar hue of the cake. Who cares about color anyway? They tasted great, with just a little bit of chocolate sneaking through the tangy cream cheese. Very excellent, and gobbled up quickly. Happy Valentine's Day indeed. Preheat the oven to 350°F. Line a muffin tray with liners. Beat the butter and sugar in an electric mixer until light and fluffy. Add the egg and beat until fully incorporated. In a large bowl, sift together the flour, cornstarch, cocoa powder, baking soda, baking powder, and salt. In another bowl, whisk together the buttermilk, vinegar, vanilla extract, and red food coloring. Add half of the dry ingredients and mix, then add half of the wet. Repeat. Spoon into cupcake liners, about 1/2 to 3/4 of the way full (I went too far and ended up with mushrooms...). Bake for 18-22 minutes for regular-sized cupcakes, 15-18 minutes for miniature cupcakes, or until a toothpick comes out clean. Cool on wire racks. For the frosting, cream the butter and cream cheese together, add the vanilla extract, and mix. Add the powdered sugar until the ideal sweetness and consistency is reached. They'll take good care of ya. And hey, last reminder--the deadline for sending me your contribution to the celebration of all things cinnamon is Friday night. The more, the merrier. I love the light pink frosting. I really enjoy when red velvet doesn't look too red, but more reddish brown. Love the pink velvet cupcakes, Grace! The red always scares me a bit. Happy Valentine's Day! Agreed with Tiffany above - red velvet cake always seems a bit intense to me, but pink seems a bit more subtle and lovely for V-Day. Yummy cupcakes! Happy Valentine's Day to you! First of all, awesome Seinfeld reference. Secondly, I think you and I have a similar conception of Valentine's day. Pink and sugar...two awesome indulgences. By the way, I'm also a huge fan of Feb. 15 when all the chocolate goes on sale...that makes for some inspired baked goods! Love the idea of pink velvet cupcakes! These look delicious, I can't resist cream cheese frosting. And perfect and versatile for bab showers...beauteeful. We definitely speak the same language. Although I wish I had thought of the pink frosting - just a good excuse for round 2! Butter in both cupcakes & icing; Be Still My Heart! Being a bit of a Diva I too love velvet! Your cupcakes are soooooo cute and decadent :D A great choice for Valentines!!! thanks for sharing other options too! The frosting looks gorgeous! What a great way to indulge. Girl, talk to me. Red Velvet is part of my blog's namesake. I use the old fashioned recipe - a recipe that's been in my fam for 60 years. Me and hubby go wacko for it when it's in the house - it's all we can think of. We're weird like that. Embarrassing. I want that damn cupcake. Gotta love Seinfeld:) The cupcakes look very pretty in pink!! Valentine's Day is all about consuming goodies, and these cupcakes will work nicely! 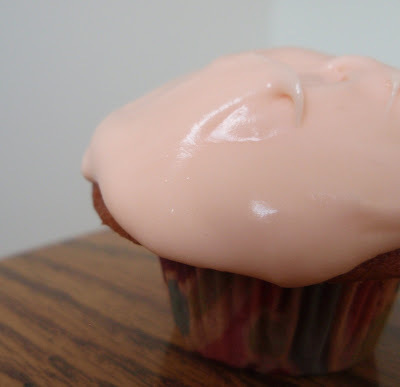 Your pink frosting is perfect. MMMMM, those look excellent. I love the generous amount of frosting. Question...my cupcakes often come out the same way as yours did with a lip & not as domed as other cuppycakes. Is is because of over filling the cupcake liners? Just wondered either way they still taste great!!! Oh I must say these are just stunning. I love pink way better than the red, anyday. I've never had red velvet cake or cupcakes before - I guess it's time. Can't wait to try this recipe. Red velvet cake with cream cheese frosting has always been one of my favorites. I have a great aunt who would bake a five layer red velvet cake for my birthday each year. It was delish! How easily a child's love can be bought with red velvet!! rofl love the lead in quote. And the cupcakes--those look fantastic! I just saw a recipe for red velvet cupcakes today on a video from Gourmet. They looked yum and can see why the cake won out. I have never had red velvet cheesecake though, A must try! I love the velvety look of that frrosting. Lick-a-licious! I wouldn't want to use that much red food coloring, either. I still remember when I was a little kid and scientists announced that you shouldn't eat "Red Dye #2". I won't eat maraschino cherries to this day. Valentine's Day is just not so exciting when you have been married a long time! hahahahaha! These cupcakes are dreamy looking...in a "I want to eat them now" way! 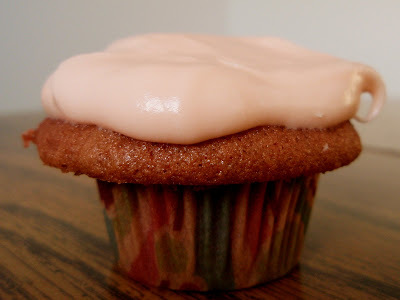 Yeah, that frosting looks like a pink cloud of yumminess...forget the potluck, I would've kept them for myself ;). They have recaps of Seinfeld episodes on Wikipedia? Who knew! Pink velvet cupcakes sound much more appetizing to me then red velvet. I seriously can't get over the sheer quantity of red food coloring in the RV versions. Scary! Sooo... good call! They look so cute. We really don't get into it either, I mean what we are doing for Valentines most people would really think to not be romantic..we are going to the monster truck show. I however love going to the monster truck show every year and this year it just so happens to be on valentines day. I will be with the one I love and yes maybe we will share in something ooey and gooey like your cupcake. LOOKS SO GOOD! pink velvet may be the only thing better than red velvet :) happy valentines, grace! Oh good reminder, I have some valentines socks! That's about as much pink as I can wear. That cupcake sounds delicious and I think pink is much more appetizing. Wow, those looks SSOOOOOO good. The perfect Valentine's treat! The color of the frosting turned out cute, and I'm sure it all was just divine! I'm going to have to make these now!! I would stand at the food table where these are holding court. The frosting alone is perfection. They look lovely! You know, I don't think I've ever had red velvet anything! I've heard of it, just not had it. Yours are just wonderful, especially that frosting, and I look forward to hearing about that cheesecake, too! Those are mighty tasty looking little cupcakes. I think the pink frosting is grand since it is my favorite color! Happy Valentine's Day Grace! Yum I could eat some right now! I know what you mean about the red I tried to make a strawberry cake once with just strawberry puree it was all nice and pink in batter form but a nice shade of brown gray when it came out. I'll have to use food coloring next time. Look at that icing slowly oozing off the side of that red velvet cupcake. I want to lick the bowl ... please! These look absolutely beautiful. I love your photos! I am so starring this! Your entire blog is fantastic. Aww...I would love these...if only I wasn't allergic to food coloring...these would be the first on my list. I am such a sucker for any Seinfeld references! Loved the Seinfeld reference. I've always been nervous about red velvet cake because of all of the food coloring. I think going pink is the perfect solution! What a delicious pink velvet, so perfect for valentine's! Yes, I agree - Valentines is just an excuse to eat lovely sweets like these!! Hey, Grace! Gotta love it: PINK Velvet Cupcakes: what a fabulous idea for Valentine's Day! You just can't beat a good ol' Southern dessert. LOL, everytime I make Red Velvet Cake, I can't help but wonder if "red food dye intoxication" is the cause for how widely this cake is loved. The cupcakes are gorgeous. Thanks for sharing! Oh my! Those look so pink and sweet and delicious. It looks so pretty Grace i love it! Oh I wish I had one of these to eat for dessert tonight! How festive for Valentine's Day, and I love the pink icing! An office potluck sounds like a nice idea. Those cupcakes look good! I like the thick layer of frosting! I saw the Red Velvet Cheesecake somewhere around in the blogosphere and was intrigued because so far Red Velvet Cake is just on my list of things to try before I die. Good choice with the cupcakes though. You can freeze them and save them for later. Nothing beats a nice red velvet cupcake! I swear this is true! I hadn't had a chance to get on the computer and check blogs for a few days so I read this entry just Monday 2/16. Anyway right after I read your red velvet post, I turned on the TV, was flipping channels, stopped at an old Seinfeld episode, and it was George standing in his new girlfriend's apartment admiring her VELVET COUCH, saying "Velvet, I'd drape myself in it..."! I haven't watched a Seinfeld episode in years! What are the odds?!? i easily enjoy your posting taste, very unique. looking forward to view additional of your content, thankx!